There is no news of the dogs I could share with you today. Like me I know you are crossing your fingers for news to break that the last dogs are seized before February 1. No news isn't always good news in our case, knowing they will spent another day and night in that hellhole. Maybe today the papers are not writing, and the TV is not broadcasting, but social media is bobbling with activity. This is the second week, of what is starting to evolve into a grassroots campaign to save the thirty-three dogs left inside the puppy mill and to put the Danish puppy mill out of business once and for all. With a hat tip to Jan Wolfe and Judith Broug, masterminds behind a social media effort launched today, in an attempt to try and track down who bought a Hovawart or Golden Retriever puppy from the puppy mill since August, 2012. As the puppy mills license was revoked by that time, any selling of puppies after that date by the puppy mill can be prosecuted under criminal law in Denmark. A great opportunity to shut them done once and for all. Jan and Judith created this "wanted" poster, which you can "share" on your Facebook wall to get the word out. Please use the "share" option of Facebook, as that will include the accompanying text who to contact as well. Before I could finish writing this, it has already been shared more than 90 times, so it looks very promising. Another hat tip to bloggers Lana Fortuna and Agnieszka Bieńko, for blogging in Slovenian and Polish respectively, to spread the word about the Danish puppy mill. There is a lot of attention from Polish readers lately, no doubt because you are worried in Poland what happened with Bamira, not knowing if she is safe, or still inside the puppy mill. I am glad Agnieszka Bieńko - and Heban - are bringing you updates in Polish. We all hope and pray with you. And then there is all of you that are helping in every other way you can. Your engagement in this, what now is turning into a grassroots campaign, is amazing. I am glad to be a part of such a great group of people, that have their heart in the right place, want to make a difference, and would do almost anything to save these dogs. Join me in a prayer tonight for the dogs. 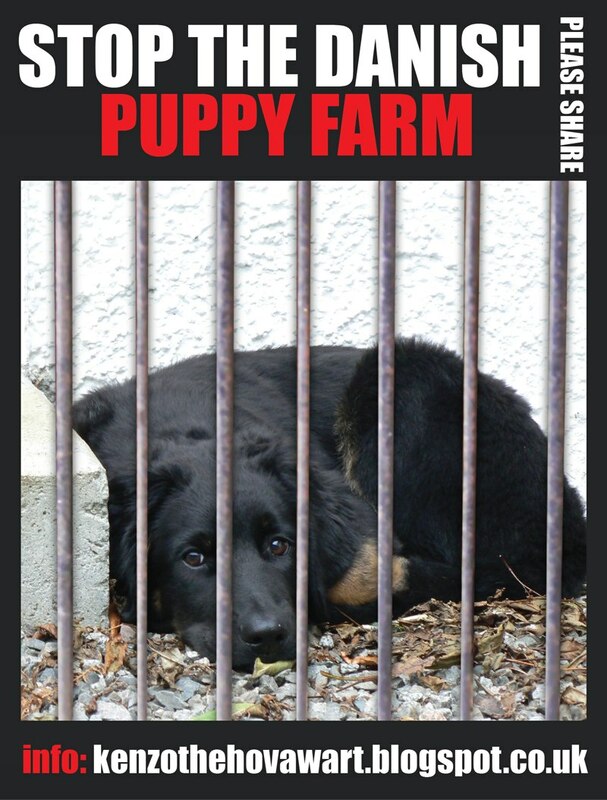 There is a Stop Danish Hovawart Puppy Mill page you can bookmark. It will have the latest news, how you can help and a chronological order of events, in the hope to make it easier for you to find the information you need, without that you have to sift through the blog pages. This seems like it is going on for ever. Can't someone pull their ...... finger out? Thanx for the pup-date. Our paws are crossed. Three cheer for the Poles. We love Poland. Have a super fun Saturday. The dogs have been released Molly! I think five are missing, but the police are involved in that. I will let Kenzo tell the story later, but the dogs are now being cared for at the same animal shelter as the other ones. First Dogs Adopted: Now What? Am I A Hova Now? Or Half-a-Hovawart?